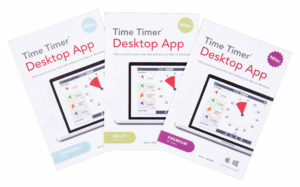 Make every moment count during your busy day with the Time Timer Desktop Software app! Stress-free time management for office, home and school. A unique visual timer application for both the Mac and PC. The Time Timer Desktop App gives you the ability to customize, save and reuse timers with names, colours, alert and scale options and more! 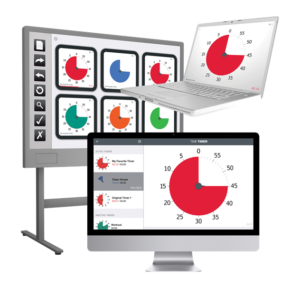 Visualize time in innovative new ways with Time Timer Software. You can choose any duration — from 30 seconds to 12 hours — and automatically repeat your countdown. The timer window can scale on your screen or float on top of other applications. Customise your Time Timer by choosing from 4 different colors timer disks and 16 different audible alerts. Keep entire groups working together with the same sense of urgency and time remaining. Windows & Macintosh (OSX) compatible.